"Founded in 1946, Uncle Milton creates, develops, produces and markets toys which have outstanding play value and maximum kid-appeal. Its primary brands are focused in the science and nature categories and include Star Wars™ Science, Explore It!™, Back 2 Nature®, Ant Farm® and Tarantula Planet™. The Ant Farm™ brand ant habitat has grown to become a universally recognized icon of American pop culture. Building on the quality and innovation of its flagship brand, Uncle Milton introduced its STAR WARS™ Science brand that combines the unique appeal of the STAR WARS universe with developments in earth-based technology. Today, Uncle Milton leads the science and nature category with popular products that inspire wonder, learning and fun." "Launch Boba Fett sky-high and perform three different flight experiments. Just step on the launch pad and watch him fly. Does Boba Fett land in a different place when he has his jetpack on? Does the jetpack go higher if it's launched on its own? Experiment over and over to find out with the Boba Fett Launch Lab! Soars up to 50 feet! 3 Launch modes! Easy to use air pump." What we thought: What a blast! No pun intended:) Both A and D really enjoyed this toy. They've played with toys like this before, but this one was different than the others, better actually:) What made this launcher so unique (other than the cool Star Wars decor) was the neat experiments you could do with it. The kids loved making up hypotheses on which way the launcher would go higher. We really enjoyed building and un-building our Boba Fett launcher and experimenting over and over. 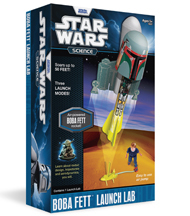 This is a really fun way to learn about rocket-building, trajectory and aerodynamics that I think all kids would enjoy:) ABCD Diaries gives the Boba Fett Launch Lab from Uncle Milton an A+! Buy It: Find this cool toy and lots of other cool learning toys at Uncle Milton!